After an awesome weekend in Songtan we headed home, unpacked, relaxed for about an hour and decided to get back out on the road and drive around without a plan or place in mind. We invited our friends and they gladly accepted to join us. 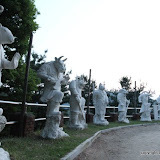 As we are driving around the countryside we noticed that we were the only non-Koreans in the area; information (in English) is extremely hard to find on the temple and after researching we learned that the Beomryunsa Temple, which dated far back to the Shilla Dynasty and was rebuilt in 1970. There was also the Bittul Tombstone (also called Seolinguibi), which leaned to one side. We are still trying to find more information on the temple and if anyone has more please send us an email. Hope you have a great but safe holiday weekend.